New York-based Casper is probably one of the most popular e-commerce, direct-to consumer mattress brands today—and it’s not hard to figure out why. When the company was founded in 2013, their successful flagship Casper mattress was one of the trailblazers of the “one mattress fits all” approach that many mattress-in-a-box business models were following at the time. Not content to rest on their laurels, Casper has continued to improve on their flagship product, coming out with redesigns over the years. This same drive for innovation has also led to two new Casper mattress models: the luxurious Casper Wave, and the budget-friendly Casper Essential. 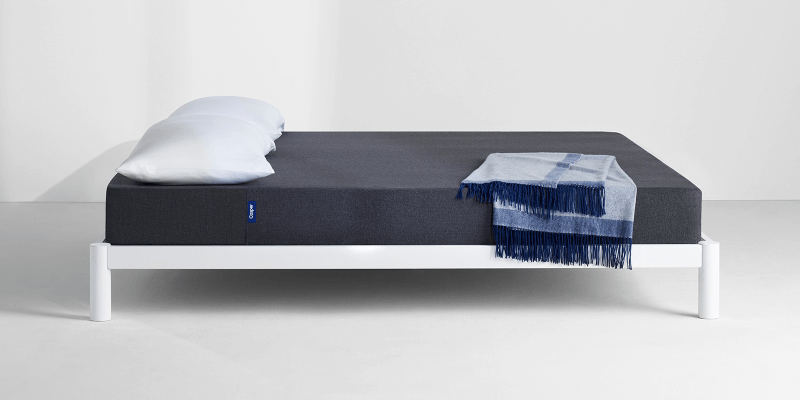 Below, we find out what makes the Casper Essential tick: what’s in it, what’s different about it, and how it manages to provide comfort and customer satisfaction despite being much more affordable than other mattresses in the Casper product line. The Casper Essential is what you’d expect from the most affordable mattress option in an entire product line. Compared to the flagship Casper and the Casper Wave, the Casper Essential is the thinnest, most lightweight, and simplest in terms of design: the construction is basically just three layers of CertiPUR-US approved foam, a fire sock, and a removable cover. One can say that it’s a more streamlined and efficient version of the flagship Casper mattress. Now, let’s break down all the layers. What’s Inside the Casper Essential Mattress? The two-inch top layer is made of open-cell poly foam. The Casper Essential shares this particular design element with the flagship Casper mattress; and this top foam does the same job for both products. Its breathable nature offers helps with temperature regulation and provides cooling; and overall the material is meant to offer support with a touch of softness and a little bit of bounce. The one-inch middle layer is made of responsive memory foam. Because the memory foam is both responsive and sandwiched between the top and bottom foam layers, sleepers can experience only the best of that the material has to offer: pressure relief and a hint of contour. None of the common memory foam complaints, like heat retention and excess body sinkage, are present. The bottom layer is made of high density poly foam. Again, this design element is also present in the flagship Casper mattress. Unlike the softer top foam, this durable poly foam layer is not only much thicker but also much firmer. It is a base layer that provides both foundational and deep compression support for the other foam layers above, in addition to anyone sleeping on the mattress; and helps the product hold its shape and structure. The layers are stacked and then wrapped in a snug proprietary fire sock made of woven silica. Finally, there’s the Casper Essential mattress cover: Removable using a zipper and made of 100% polyester, it’s again a simpler version of what you can find on the flagship Casper. No paneling, and one color all over; even more minimalist than the contrasting white-and-grey design of the original. How Can You Customize Your Casper Essential Mattress Order? Like all Casper mattress products the Casper Essential is available in six standard US sizes: twin, twin XL, full, queen, king and California king. It is the lightest among the Casper mattresses, with its queen size only at 63 pounds; compared to the flagship queen’s 71 pounds and the Casper Wave queen’s 109 pounds. Purchasing the Casper Essential on the company’s official website comes with some understandable upsells, too. Optional add-ons in the form of other Casper sleep products—a mattress protector, a pillow, a bed foundation, and a duvet—will present themselves once you add the Casper Essential to your online shopping cart. Important to note: You can’t customize Casper mattresses by choosing softer or firmer variants of the same model. As it can be a make-or-break consideration, let’s explain the last sentence from the previous section: While the existence of the Casper Essential comes from the company evolving past the formerly trendy “one mattress fits all” approach, all Casper mattresses come with their own singular feel and comfort level. Generally, the Casper Essential is rated as firmer than the Casper Wave, but softer than the flagship Casper mattress. We’ll discuss the actual feel of the Casper Essential in more detail later on. Another consideration that you may overlook is the thickness of the Casper Essential. It is definitely thinner than the typical mattress-in-a-box offering, but just because it doesn’t fit the current industry average—about 10 inches, give or take–does not mean that it’s not within industry standards. Many innerspring and memory foam mattresses available today are much thinner—some going down to just five inches thick! However, it must be noted the eight-and-a-half-inch Casper Essential may not be ideal for some. What Can Be Used with the Casper Essential Mattress? Of course, Casper recommends their own products for this: the Casper foundation and metal frame. Using Casper products with each other practically guarantees warranty coverage. However, any setup with firm and direct support will do. You can use an adjustable base, a platform bed, or any foundation with a metal frame and with slats less than four inches apart. What about the floor? This is a bad idea for the Casper Essential because of two things: One is that there’s an increased tendency for the mattress to get dirty and retain heat and moisture on the floor; you may be looking at a voided warranty down the line if you choose to use your Casper Essential this way. Another is that the mattress is already less than ten inches thick, which means that if you lay it on the floor—even with a bunkie board or similar items underneath—it will be that much more difficult to get in and out of bed. Not a big problem if you’re young and fit, but a big consideration for older and heavier sleepers. How Easy Is It to Set Up the Casper Essential Mattress? Like most direct-to-consumer mattress-in-a-box products that you can purchase online, the Casper Essential gets delivered to your front door. 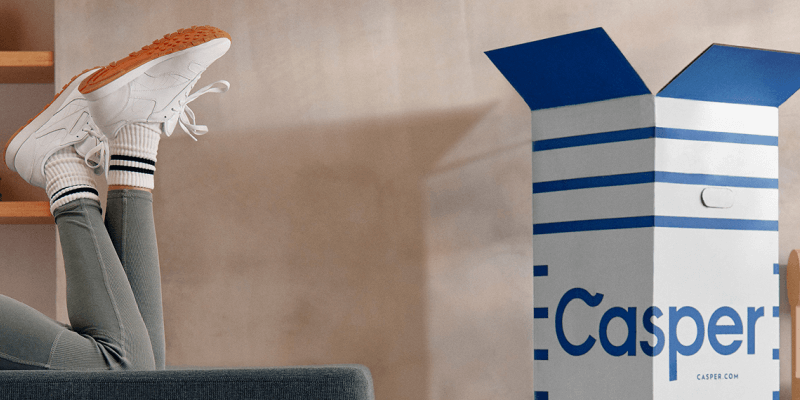 There’s no complimentary white glove service—that is, for deliverymen to carry the package into your home and set up the mattress in your bedroom—for the Casper Essential; that perk is included in Casper Wave purchases, though. However, you can request it—as well as help with old mattress, foundation and box spring removal or recycling— for separate additional fees. Important to note: Once the package containing your Casper mattress arrives, you can wait a maximum of three months before you open the box. Ideally, you should open it right away; because the sleep trial period starts the day the Casper mattress is delivered. Sometime, though, circumstances will force your hand! You might be in the middle of moving houses, or you might be on a business trip, or some other similar situation may arise. Just remember that beyond three months, the compression of the product will start to affect the structural integrity of the Casper Essential. So you’ve dragged or carried the box to your bedroom—there are handles on the sides of the cardboard box, which are much appreciated—and you’ve unpacked the mattress. What’s next? Remember that once the mattress is unwrapped, it will start expanding immediately; so it’s a good idea to have it directly on the bed already when you remove the plastic covering. As it’s made of foam, they may be a mild “new mattress smell”, which will dissipate in a few hours or days; depending on how well-ventilated the area is. Take all the external packaging material and throw it away. Don’t leave it in the room, as some of the scent may come from it. A note on cleaning: Although the Casper Essential’s cover is easily removable, it is not machine washable. Repeat: Not machine washable! It may shrink or warp if you put it in the wash, so it’s best to spot clean or hand wash carefully. What’s the Weight Capacity of the Casper Essential Mattress? It’s official: Casper claims that all their mattresses have no actual weight limit, and can support people of “all shapes and sizes”. We are cautiously optimistic about this, but we do recommend that the Casper Essential be rotated twice or thrice a year in order to even out wear from weight distribution—especially if the mattress is being used by heavier or larger sleepers! How Does the Casper Essential Mattress Feel? Of course, the flagship Casper mattress is more popular, and the bulk of Casper customer reviews we encountered online focus on that product. The Casper Essential is fairly new to the game, but the response seems to be generally positive—about what you’d expect from a cheaper, no frills version of the flagship product. Many note that it feels a little firmer than they expected, and even more note that the comfort is surprising for the price point. A few negative comments we’ve found focused on the overall quality of the product; which is understandable, especially if it’s being compared to the flagship Casper mattress. Although both are high quality and ostensibly equally durable, there must be a reason for the price gap. We believe it’s all the little things! For example: We know from reviewing the flagship Casper mattress features a zip-off cover with a hand-sewn, more complex design; compared to the very basic cover of the Casper Essential. In terms of comfort level, though, the flagship product is actually firmer than the Casper Essential—so people wanting something softer should find this mattress ideal. Casper has built up a good reputation over the years, and it’s no longer a new player in the game by any stretch. While the company is part of the contemporary wave of online mattress stores that eschew traditional showrooms and face-to-face sales talk, they are also early adopters of the e-commerce mattress business model—and they’ve had time to spread the word! From celebrity investors and endorsers to an ever growing product line, there’s a lot to be said for a company that keeps moving with the times. This tells us that Casper response times to big issues are probably going to be faster, and fixes and probably going to be more effective; compared to what their competitors may think of as standard practice. One of the best things about Casper is that they’re very active online. Should you have a question or a concern that doesn’t need immediate handling, you can always check out their social media accounts. They regularly interact with their customers and often update their feeds with information about new products and sale periods. If you’re not much for social interaction, you can check out their extensive FAQ section on their official website. When it comes to actual customer service, we’re happy to report that the customer support team—made up of what they call “snooze specialists”—is easily accessible across a variety of contact venues: telephone hotline, email and even the elusive live chat option. About that last part: We love that the live chat option isn’t the naggy kind! You know what we mean: Sometimes live chat on product websites can get a little spammy and out of control. Casper’s live chat is just there if you need it, like it should be; and they answer quickly, too. Because Casper was founded in 2013, there’s no proof—anecdotal or otherwise—that a Casper Essential can last beyond or even within the typical 10-year usable lifespan of a mattress. It’s a good thing, then, that every Casper mattress comes with a 10-year limited warranty. 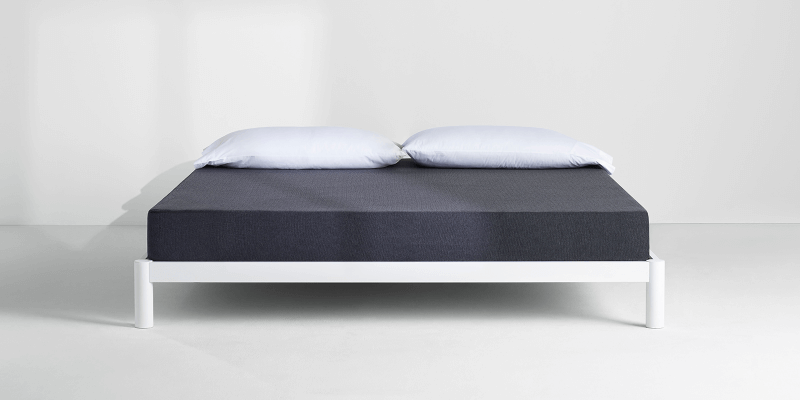 On top of the 10-year limited warranty, there’s the industry-standard 100-night sleep trial. You probably already know how this works, because almost every online mattress store has some version of the same trial and policy. For the uninitiated: This is a simple, risk-free return policy that comes with a very long trial period. Think of it as a 100-day money-back guarantee, no questions asked. This takes the place of the long hours you would have spent in mattress showrooms trying each mattress out for five minutes each! With the sleep trial, you’ll get to try out a mattress for a much longer time—as you should—and return it with a full refund if it turns out that it’s not compatibly with your preferences. How do you return the Casper Essential if it’s not to your liking? First: Make sure that you’re within the 100-day sleep trial period. If you are, all you need to do it contact Casper’s customer support team, and they will arrange everything: mattress pickup, donation or recycling, and full refund after that’s all done. How Much Does the Casper Essential Mattress Cost? As of this writing, the queen-sized Casper Essential mattress is available for $600. Every purchase includes free shipping if you’re in the US or Canada. Delivery time is estimated to be between two to five business days after order placement, and returns are processed for free. We also should add that some negative feedback we’ve seen regarding the Casper Essential, as well as other Casper mattresses, had to do with the delivery time! Should you order a Casper mattress, make sure to immediately establish a communication line between you and their support team. This ensures that if you run into any delay or trouble, at least you should be informed directly. Though the Casper Essential seems to be just a typical but perfectly serviceable foam mattress, it’s hard to ignore the attractive price point! Combine the price with all the bells and whistles that come with every Casper mattress—the 100-night sleep trial with return policy, the 10-year limited warranty, and great customer service—and you have what we cautiously predict will be Casper’s next bestseller. The Casper Essential is a little thinner than we’d like, and we would have qualms recommending it offhand to someone that’s on the heavy or large side, but it is an excellent starter mattress. Easy to move around, easy to clean and easy on the pocket; what more can a sleeper on a budget ask for?